Is Google Showing Cracks in its Search Armour? As marketers look to start the new year off on the right foot they must understand how consumers are viewing their ads. IgnitionOne, a provider of digital marketing solutions, has released their latest report which details digital marketing trends and activities from Q4 2014. 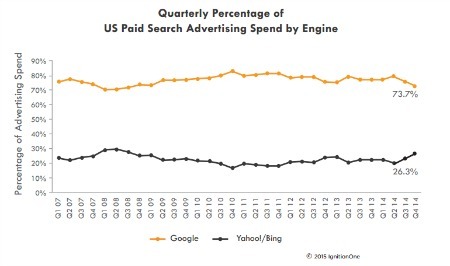 While the report outlines many interesting trends, one of the most surprising findings was that Yahoo and Bing demonstrated their highest combined percentage of U.S. search spend (26.3 percent versus Google’s 73.7 percent) since 2008. Another interesting finding from the report is that marketers are designating more of their budgets to programmatic display ads (spend up 35 percent year-over-year) due to the capability for stronger trackable results. Other findings from the report include YoY spending for tablets was up 37 percent while mobile phone spend increased 78 percent.